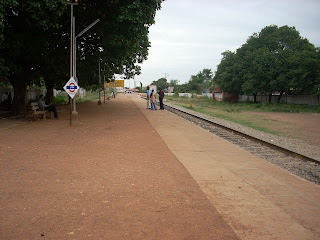 KGF was not connected directly to the Railway line connecting Madras and Bangalore. We had to take the local train from KGF to Bangarapet Junction to catch the Madras or Trichy trains. Sometimes we also went to Bangarapet to meet any of our relatives coming in from Madras or Trichy by train or to leave them at the Bangarapet station when it was time for them to go back. These were unexpected outings and we loved traveling by this local train. 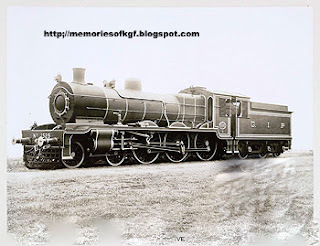 Our KGF train in those days had about 10 bogies and was pulled by a Steam Engine. On the journey from Marikuppam to Bangarapet Junction, (stopping at Champion Reef, Oorgaum, Balaghat and BEML stations), the train normally took around 35 minutes to reach Bangarapet, as it was down hill most of the way. It would careen along the tracks rushing past the tunnels and rocks at full speed. However on the return journey to KGF, the train took about 10 minutes more as it had to huff and puff uphill. The poor old Steam Engine would strain and wheeze up hill like an old man. However, it always managed to conquer the hilly terrain and reach KGF safely without any mishaps or breakdowns on the way. When we were small children, my dad would tell us that the steam engine was telling itself “I know I can, I will, I must” as it chugged along. He told us to take the example of this steam engine and say these words “I know I can, I will, I must” whenever we were faced with a difficult situation. Our house was very close to the Oorgaum Railway station and we frequently used our local train to commute between the various places in KGF such as going to St Sebastian’s Church in Coromandel, to Our Lady of Victories Church in Chanpion Reefs, or to our school for music lessons during the holidays, and sometimes in the evenings to the mining hospital to visit friends who was admitted there etc. 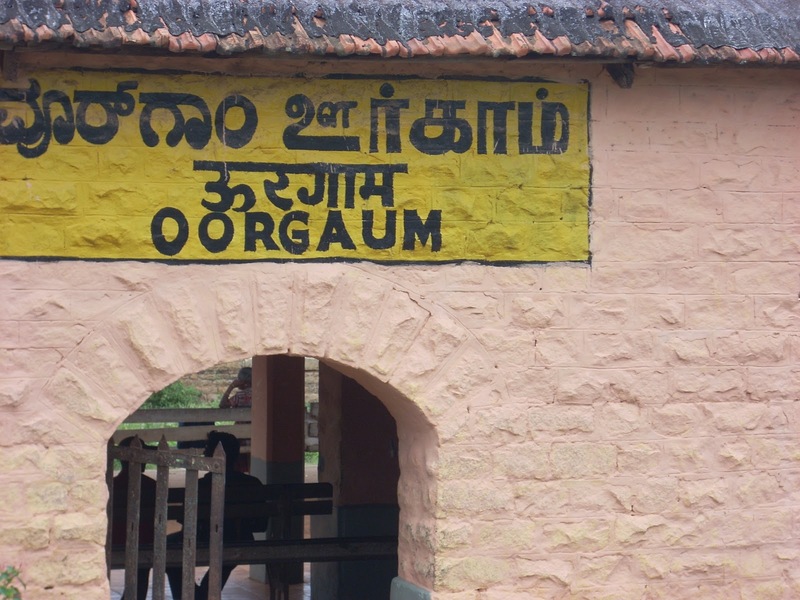 We’d get the train at Oorgaum Station and the Station Master would always welcome us with a smile as he knew all of us well. The canteen on Oorgaum Station sold very appetizing Vadas, Bondas and other snacks which were quite cheap and tasty. We would munch on these tasty tidbits while waiting for the train. The train tickets too didn’t cost much in those days, just a few annas and it was a convenient and cheap means of traveling for us. In those days most of the Railway staff were Anglo-Indians. The train driver who I remember the most was Mr. Hall whose daughters Marie and Irene studied with us in St Joseph’s Convent. Uncle Hall would sometimes allow us to ride with him in the Engine and we would get to blow the whistle as we entered Champion reef Station. Our favourite guard was Mr. Tommy Gaughn whose daughter Charmaine also studied with us in the Convent. 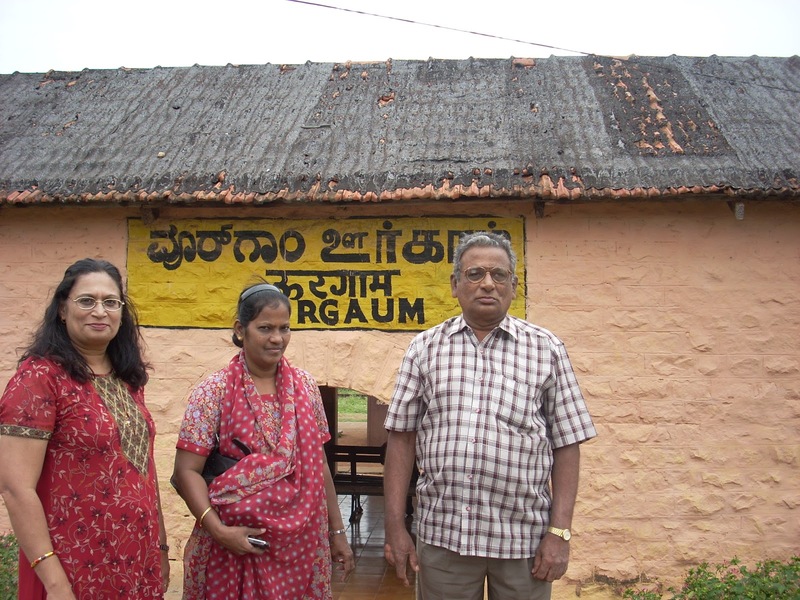 The railway staff lived in the railway colony in Bangarapet so the Halls and Gaughn children traveled from Bangarapet to school in Champion Reefs by train everyday. Now whenever we pass Bangarapet station on our way to Madras and back, memories of our childhood trips by the local KGF Train keep crowding back. 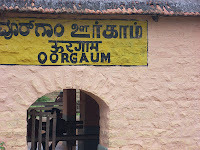 Your upload reminded my boyhood days at Oorgam (near KGF Kolar Gold Field) Railway station. 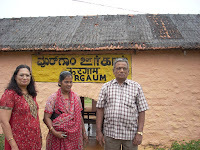 My father(M.V.Janardhanan) was employed at the station. Yes in those days most of the Railway staff were Anglo-Indians. The train drivers used used to pull me up and take me along during shunting operations. I used to hang on the whistle rope to make whistle which I enjoyed most. When we were small children, even my dad would tell us that the steam engine was telling itself “I know I can, I will, I must” as it chugged along. He told us to take the example of this steam engine and say these words “I know I can, I will, I must” whenever we were faced with a difficult situation. Great post sir keep it up.